Great Falls, Montana offers many shopping adventures, all around town. To make it easy, the sections of town that contain shopping opportunities have been highlighted. With over 30 unique boutiques, coffee shops, restaurants, and retailers, there is plenty of character here. Downtown is also home to Montana’s Largest Specialty Dry Goods Store, Dragonfly Dry Goods, who features brands that include Joseph Ribkoff, Tommy Bahama, Fossil, Brighton, Alegria, WoodWick, and Fly. At The Blue Rose you will find Frye, Rails, Eileen Fisher, Velvet, Velvetmen, Three Dots, Joe’s Jeans, Love Heals Jewelry, Dogeared, Kai Fragrance, Velvet, Johnny Was, 360 Cashmere, among many others. 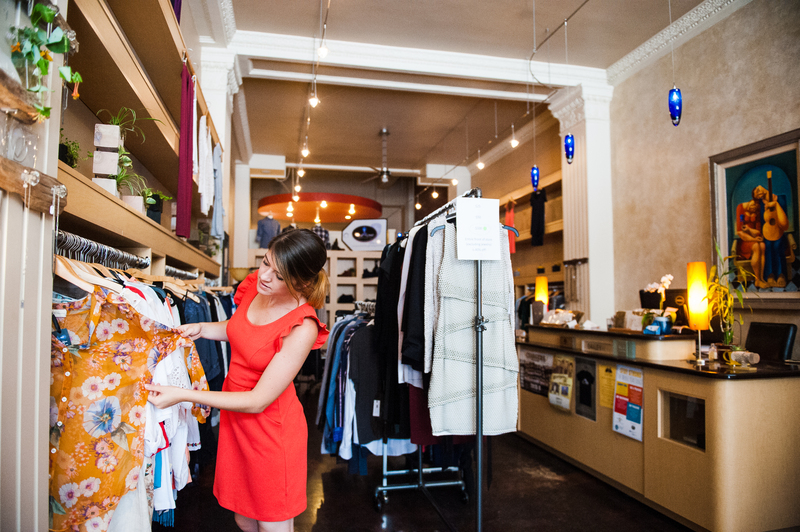 Other brands you can find to outfit yourself and your home in our downtown stores include: Archipelago Thymes, Able, Chan Luu, Pandora, Lyocell, Perfect fragrance, Hanky Panky, Free People, Citizens of Humanity, AG Jeans, Le Blanc, Hudson Jeans, Le Creuset, Joe’s Jeans, Yumi Kim, Cuisinart, Vince, and many more. You will also find galleries and unique Montana Artisan products. As one of the main travel corridors through Great Falls, Montana, shopping can be found all along. The East end of this corridor is anchored by Wal-Mart and the West end is anchored by the Marketplace Shopping District. Along the way you will find Conlin’s Furniture and Ashley Home Stores; North 40 Farm & Ranch Supply, Big Sky Harley-Davidson, Jo-Ann Fabrics & Crafts, Target, Walgreens, CVS Pharmacy, and retail opportunities for buying recreational vehicles, clothes, groceries, and more. The biggest shopping complex on 10th Avenue South is Holiday Village Mall. The shopping here features JC Penney, Sephora, Scheels All Sports, Pet Smart, and Hobby Lobby, sought-after retailers Buckle, Victoria’s Secret, Ross Dress for Less and Bath & Body Works, quality regional retailers such as Maurices, Jensen Jewelers, Zumiez, Claire’s and rue21, and other name-brand stores, specialty boutiques, restaurants and service providers. The Marketplace Shopping Center is located on the West end of Great Falls, Montana and holds several name brand stores that include Barnes & Noble, Famous Footwear, Home Depot, Office Max, Old Navy, Michaels Arts & Crafts and Petco, Denver Mattress, Oak Express, Sofa Mart or Pier 1 Imports and AMC Movie Theatre. Dining options are plentiful in this area as well. Like 10th Avenue South, the Northwest Bypass is another main travel corridor through Great Falls, Montana. The North end of this corridor is anchored by Wal-Mart and the West end is anchored by Sam’s Club. Between the two you will find name-brand retailers TJ Maxx, Shopko, Ace Hardware, Kmart, Staples, Aaron’s Sales and Leasing, ProBuild. This area contains other clothing, home improvement, and grocery retailers. Dining options are available along this corridor as well.